Welcome to the Turkey Tri. Come out and BURN those holiday calories with triathlon distances challenging enough for the seasoned triathlete, yet short enough for the novice triathlete. The event begins with a mile, calm, lake swim. The bike is a 14 mile (2-loop) road course that is mostly flat with a couple of small hills. The run is 4.5 miles all on paved surfaces around the lake. Everyone gets a piece of Pumpkin Pie at the finish line! USAT 1-Day License (Triathlon & Duathlon only) Triathlon $15 Relay $15/person Youth (17 & under) $10. These all can be picked at Bonelli Park, San Dimas or on the morning of the event starting at 6:00am for all participants. 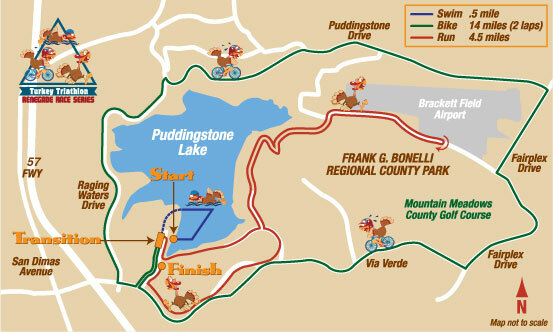 The start/finish is located on the South Shore at Bonelli Park: 120 Via Verde Park Road, San Dimas, CA. The water temperature will range somewhere between the high 60’s and low 70’s. Wetsuits are recommended for the 1/2 mile swim, but not mandatory. The 14 mile (two 7 mile loops) (all road) course will be mostly flat with a couple of small climbs. The 4.5 mile run will be on a mixture of paved roads and fire roads, and is mostly flat. You can pick up all registration materials, including race bib, t-shirt, and goody bag on race day. What is the USAT License Fee and do I need it? A: USAT one-day license allows an athlete to compete in a USA Triathlon sanctioned race without purchasing an annual membership. One-day licenses are purchased for a specific race, are non-transferable, and are non-refundable. All individuals and relay participants in the triathlon & duathlon must have a USAT-Annual license or pay $15 for a 1-day license. See website for current rates. Q: Do I have to wear my bib number and use my helmet/bike sticker? A: Bib numbers are required to participate and those who attempt to participate without bib numbers will be removed from the course. Wear your bib on the front of your run shirt. Wear helmet stickers on the front. Attach bike stickers to the front or crossbar or down tube. Q: Do races have time limits? A: Yes, most races have restrictions on how long we can close roads for participants to complete the race. If you have specific questions for an event, please email us. Q: May I wear my headphones? A: Headphones are not permitted per USAT rules. A: Please leave your pets at home. Dogs/pets are NOT allowed on race course.